"We were overwhelmed last weekend," Tyler said. "We'll have additional officers out there to keep people moving." Traffic was snarled on Interstate 15 Saturday as crowds flocked to Lake Elsinore for a chance to frolic in the rolling hills blanketed in eye-catching wildflowers thanks to this season's "Super Bloom." Officials announced a coordinated strategy on Thursday to mitigate the influx of people likely to converge on Walker Canyon this weekend. A shuttle service will be available until 8 p.m., with buses retrieving people every few minutes from a dirt parking lot adjacent to the Nichols Road exit from northbound Interstate 15, and at the Lake Elsinore Outlets Mall for people exiting I-15 from the south, officials said. 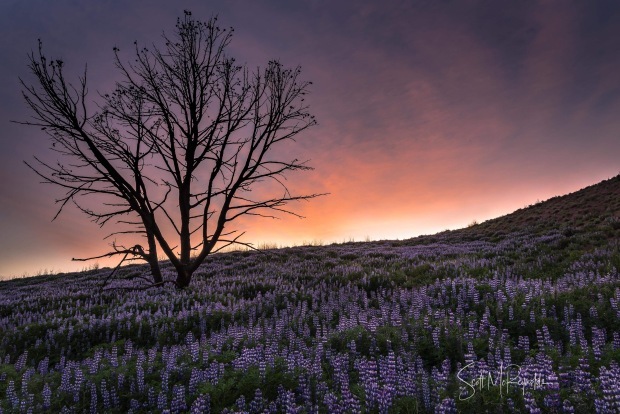 "The Super Bloom has created significant challenges for the community and shown the world the natural beauty of Lake Elsinore," Mayor Steve Manos said. "Together, we want to make this a much more manageable experience." The acres of orange and yellow poppies carpeting hillsides in Walker Canyon, thanks to heavy winter rains, were unlike anything he'd ever seen, Manos said, acknowledging that social media buzz had raised interest to a level no one could have anticipated. Traffic was slow on the southbound Interstate 15 heading into Lake Elsinore early Saturday, with some congestion on the northbound side leaving the area as well. At least 3,000 people had visited the fields just before noon, said Nicole Dailey, a spokeswoman for Lake Elsinore. She said as midday approached, crowds were expected to get heavier and shuttle wait times could increase, though so far they've been manageable, with one-hour wait times each way. 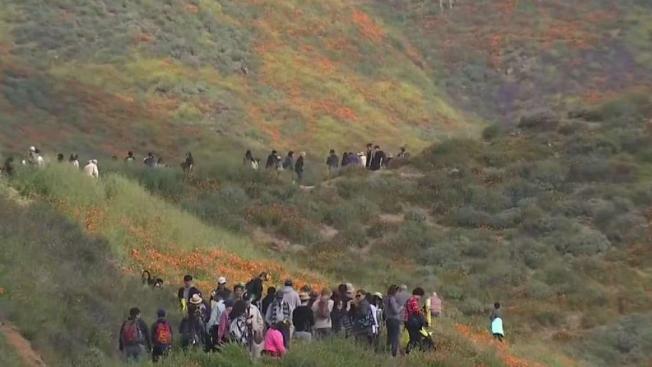 Last weekend became chaotic when sightseers -- by one estimate, 50,000 people at any given time -- swamped Lake Elsinore to trek into the canyon from Lake Street to take pictures and video, as well as walk in the poppy fields. Public safety officials completely closed access to the canyon Sunday after city roads turned into virtual parking lots, and one city employee who was attempting to direct traffic was clipped by a hit-and-run driver, suffering minor injuries. The mitigation plan this weekend incorporates full road closures, limited access routes and an expanded shuttle service to contain traffic and pedestrian volumes. Riverside County sheriff's Capt. Michael Lujan said segments of Lake Street and Nichols Road will be restricted, with no through traffic. He added that no pedestrian or vehicle traffic will be permitted to enter Walker Canyon. According to Caltrans spokesman Catalino Pining, changeable overhead message signs along I-15 and the Riverside (91) Freeway will keep motorists informed as to traffic conditions in and around Lake Elsinore, as well as what detours are in place. "Use alternate routes whenever possible -- Interstate 215 and state Route 74," Pining said. California Highway Patrol Capt. John Tyler said more officers will be "out roving" this weekend, particularly when access to the canyon will be controlled. Last Sunday, an estimated 500 motorists parked on the shoulders of I-15 and stampeded into Walker Canyon when they encountered hours-long backups going into Lake Elsinore, according to the CHP. "We ask visitors to be respectful of local residents and treat the area as you would want to be treated in your neighborhood," county Department of Transportation Director Juan Perez said. "Please be patient and follow the signage on the freeways and surface roads. We're blessed by this natural wonder, and we want this to be a good experience for all." Perez said Horsethief Canyon at Temescal Canyon Road, as well as Hostettler Road at Temescal Canyon and De Palma Road -- all in the Temescal Valley -- will be restricted to residents-only traffic, with deputies checking for identification. Area residents last weekend fumed in social media posts about the monstrous traffic and that vegetation was being needlessly trampled as people roamed into the canyon, leaving designated pathways. County Parks & Resources Chief Dustin McLain told reporters that visitors should "stay on trails, bring water and wear sturdy shoes" to view the wildflowers. "It's two miles in and two miles out to see Mother Nature at her best," McLain said, estimating that the bloom will be gone in two to three weeks. He emphasized that people should also stick to trails to avoid rattlesnakes, which are emerging from winter hibernation. More information about the weekend closures and Super Bloom sightseeing is available at www.Lake-Elsinore.org.